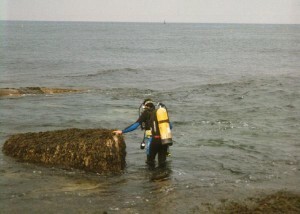 My brother, Eric, and I went for two dives this day out at Halibut Point in Rockport, MA. It was quite an adventure getting our equipment to the water. At Halibut Point, you have to park in the parking lot for the state park and that is quite a ways from the ocean. Fortunately, Eric was prepared for that and we had a small wagon to carry our equipment. It was still a fairly long, arduous trip, there and back. We often had to pull together to get the wagon over rocks, up and down stairs, etc. 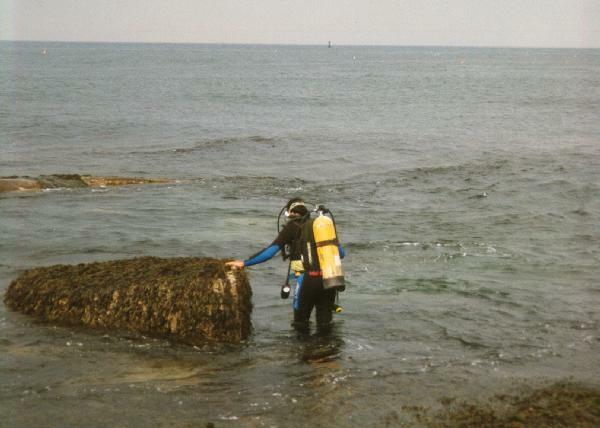 When we finally got within sight of the ocean, we had to carry our equipment a few pieces at a time over the rocks. Then we had to go back and carry the wagon. If you ever dive at Halibut Point, make sure you bring a small wagon or cart. We went for two dives. One to about 37 feet and the other to about 57 feet. The 57 foot dive is the deepest I’ve been so far. 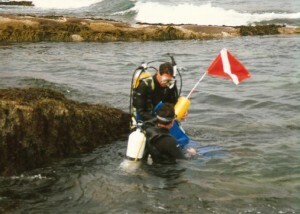 These were the best two dives I’d been on. At one point while swimming along, I noticed the biggest star fish I’ve ever seen. Eric picked it up and I placed my hand on it. With my fingers spread as wide as they would go, my hand was still narrower than just one of its arms! Imagine that. Spread the fingers of both of your hands as far apart as they can go. Now, place your hands with your two thumbs a few inches apart (to account for the body). That’s about how big this star fish was! We kept swimming along and saw more star fish just as big. We saw lots of fish. At one point, one medium sized fish was swimming at me and almost kissed me on the face! We found a giant goosefish (a really ugly fish that looks like dark brown spotted sea weed) sleeping on one of the rocks. It was larger than the flat part of my flipper. I’ve seen goosefish in aquariums before, but never one that big. We swam over a cusk, a large fish that sort of looks like a really fat eel. We saw a couple little cod and lots of sea pearch. On the way back in from one of the dives, we swam through a large group of sea gooseberries. Sea gooseberries are tiny, clear, harmless jellyfish. The lobsters were quite plentiful, and there were some large ones. There were lots and lots of very large crabs. The entire bottom was covered with huge sheets of rock. However, I don’t think I saw more than a couple of square inches of bare rock. 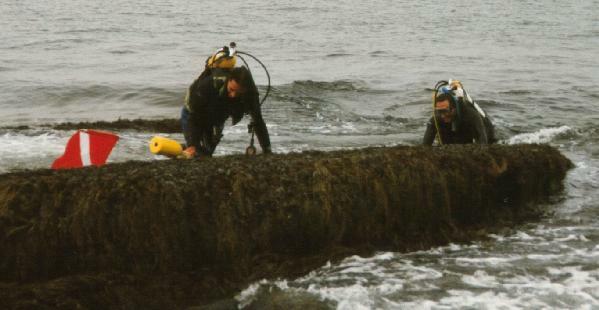 They were completely covered with sea urchins, ranging in size from smaller than a pencil eraser to as big as a softball, and gardens of sea anemonies of all different colors and sizes. It was amazing. I’ve never seen any place above or below water with this much life! (Some day I’m going to have to go see the Great Barrier Reef.) I just could not believe all the different forms of life we saw. Several times I wanted to hold onto a rock to prevent the current from moving me, but I had trouble finding a spot for just one fingertip, never mind my whole hand! It was awesome! Even though it was a real pain to get the equipment down to the water and back, this is my new favorite dive site. No questions asked. I loved these dives!